Programmed and produced Sam Green with musicians The Quavers and yMusic performing work-in-progress live score film collaborations in the 2013 River To River Festival as part of a program co-curated with Laurie Anderson. Later, I presented the L.A. debut of the “live documentary” The Love Song of R. Buckminster Fuller at the Skirball Cultural Center. 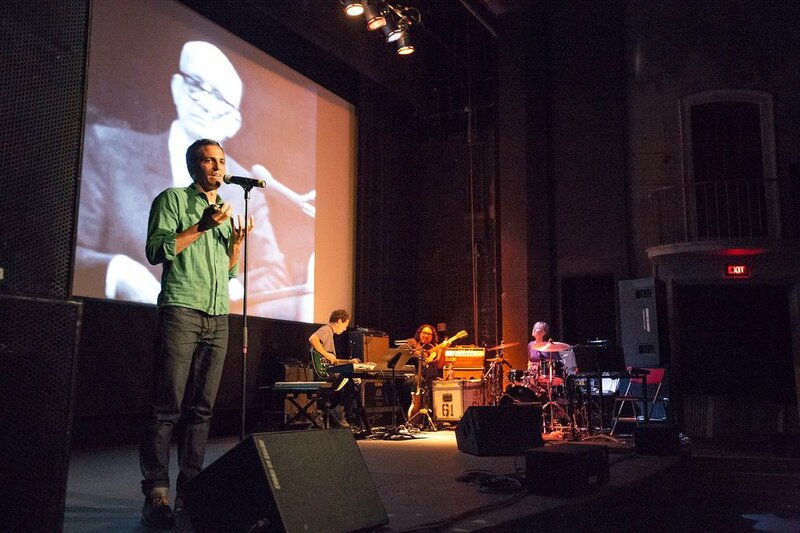 In a one-night-only engagement, taking place in an intimate 300-seat venue, the screening featured Academy Award– nominated filmmaker Sam Green narrating the film in person while the acclaimed indie rock band Yo La Tengo performs their original score. Described by acclaimed writer Rebecca Solnit as “a movie being born as you see it and hear it, as alive as music,” the documentary traces the career of twentieth-century futurist, architect, inventor, and author R. Buckminster Fuller (1895–1983), who experimented for fifty years to find out what a single person can do on behalf of humanity. In The Love Song of R. Buckminster Fuller, Green explores Fuller’s utopian vision of radical social change through a design revolution. Fuller was a grandiose and generous thinker, teeming with ideas, who once put together a forty-two-hour lecture series called “Everything I Know.” He was an early proponent of conservation and environmental stewardship as social justice: he was interested in “doing more with less,” so that everybody could have enough. He redesigned human structures from cars and bathrooms all the way up to entire cities, inspiring figures as diverse as the industrialist Henry Kaiser, John Cage, and Stewart Brand. Originally commissioned by the San Francisco Museum of Modern Art’s Design and Architecture Department, The Love Song of R. Buckminster Fuller looks at many of Fuller’s concepts and projects, ranging from his signature invention, the Geodesic dome, to some of his more conceptual plans, including a proposal to build a huge dome over Midtown Manhattan to cut down on snow removal costs. At each screening, director Sam Green takes the stage to narrate the film in real time and cue images while Yo La Tengo performs their original score. The film’s unique form draws inspiration equally from old travelogues, the Benshi tradition, and TEDtalks. The Love Song of R. Buckminster Fuller premiered May 1, 2012, at the San Francisco Museum of Modern Art as part of the 2012 San Francisco International Film Festival.